Place your order online, we will pick the stock and contact you for card payment. We then dispatch the goods. Delivery charges may apply depending on location and order size. South West Traders Ltd has been trading in Plymouth for 25 years as a wholesale cash and carry. We stock over 2000 products covering a wide range of categories at our best possible prices to customers wanting to progress their business. All of our products are not online. 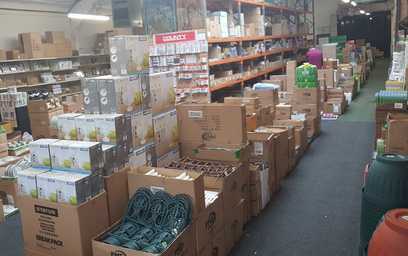 South West Traders Ltd has 5000 sq.ft of cash and carry display area backed by a large storage area. We supply retail shops and online retailers, discount stores, market traders, car boots, care homes and schools. Buy right to sell right for success. Please fill in the contact form below and we will come back to you as soon as possible. I give consent for South West Traders Ltd to use my information to contact me with regards to my enquiry and any future business subject. Please REGISTER or LOG IN to view our prices!